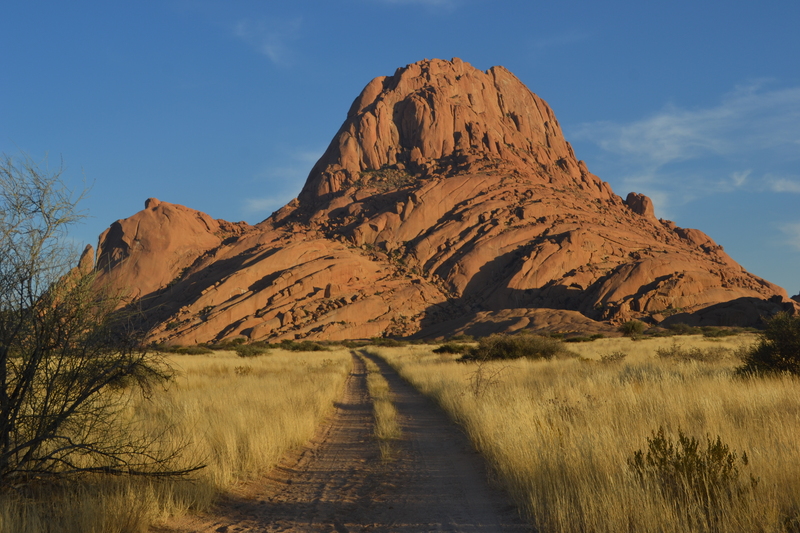 A rough, sandy excuse for a road led to the Spitzkoppe mountains. The sky was a searing blue lightly streaked with cloud. The peaks were the colour of caramel, the texture of crumpled paper. The afternoon sun lit the face of the rock, leaving their fissures and folds in deep shadow. The grass was the green-tinged yellow of over-ripened limes. In amongst it were spiky, highly poisonous, Damara milk bushes. On the rock in a hollow at the base of one peak, there are Bushmen paintings of hunters, rhinos, giraffes and jackals. They have been there at least two millennia, and anything up to six. Yet they are out in the open as if painted last week and of no more significance than a tag on a shutter in a run-down part of town. It is easy to see why Kubrick chose this timeless landscape for the dawn of man scene at the start of 2001: A Space Odyssey. Nothing much has changed since the Bushmen were there. A primitive toilet and the occasional notice are the only incursions of the modern world. The nearest town is 60km away. As so often in Africa, you come face-to-face with your own inconsequence in the earth’s epic narrative and see, for once, how petty, how parochial our conceits, our ambitions and anxieties are. We camped for the night in the lee of a mountain and the pegs got no purchase in the sand and the tents just sat on the ground, but it was a still night and there was no risk of them blowing away. Urban time has little meaning where there is nothing but natural light, so like the Bushmen millions of years before, we retired and rose with the sun. A little after dawn, we struck camp and headed out through the desert to the long, desolate shore known to the Bushmen as the Land God Made in Anger, to the Portuguese as the Gates of Hell, and now as the Skeleton Coast. Among the bleached bones of beached whales which birthed the modern name are the rusting hulks of over a thousand ships which ran aground on this treacherous shore. Diogo Cão sailed down the coast in 1486 and planted a cross to claim the cape for Portugal, but the Portuguese never got a foothold in Namibia and the Germans, who did, took down the cross in the nineteenth century and shipped it back to Germany. 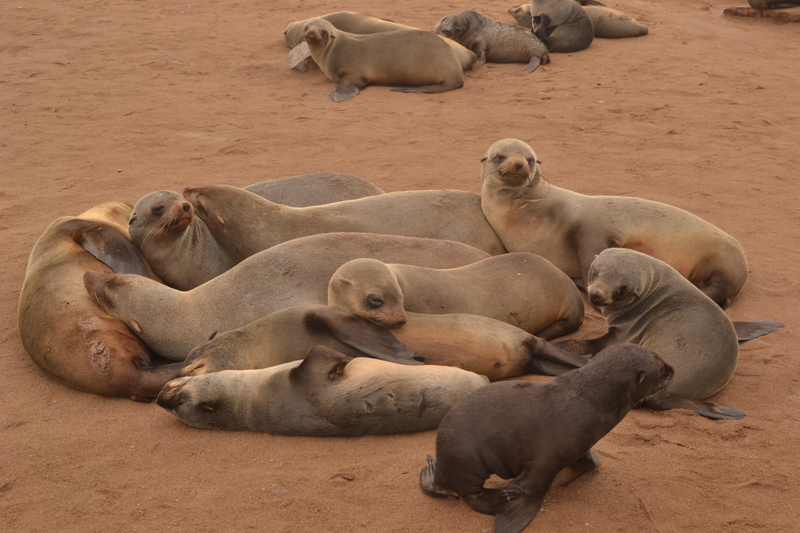 Cape Cross, where the old cross no longer stands, is home now to thousands of fur seals which swim backstroke in the surf, slide onto the rocks and lay in great piles on the sand, playing, fighting, mating and barking like fat men guffawing. They stink, of course, but they no doubt think the same about us.